This paper presents a multinomial model for a special case of the machine interference problem (MIP), where each of N identical machines randomly requests several different service types. The model allows the calculation of the expected interference time in the queue for each service type. The extended version of the model allows calculation of the exact distribution function of the steady state waiting time and total service time for each type of requested service. In addition, the model can be adjusted for the case where the service is provided by a group of K identical operators, each operator is capable to handle all types of service, but each service type has a different priority. 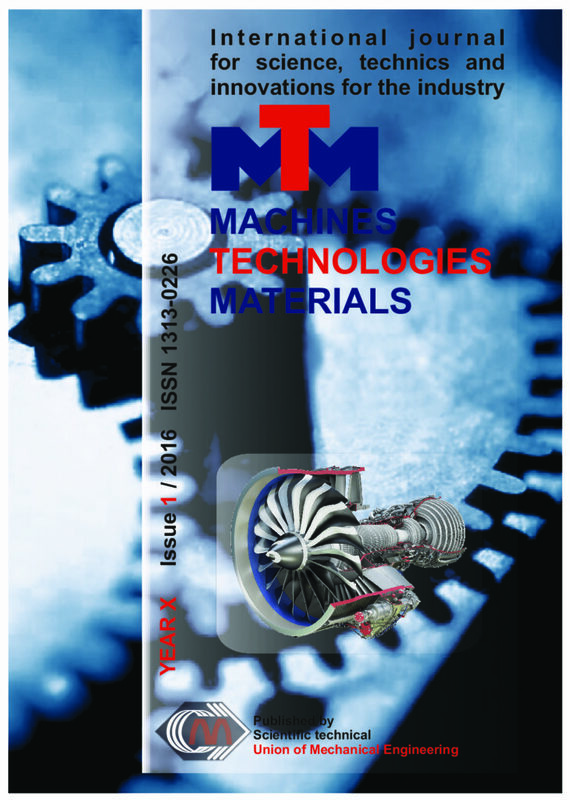 The article deals with determining of fatigue lifetime of structural materials during by multiaxial cyclic loading. The theoretical part deals with the fatigue and with criteria for evaluation of multiaxial fatigue lifetime, especially Fatemi-Socie, Smith-Watson-Topper, Brown-Miller and Liu. The experimental part deals with testing of specimens for identification of the strain-life behaviour of material and determining the number of cycles to fracture of aluminium alloy for phase shift 0° and 90°. Extensive fatigue experiments were conducted using 6063.T66 aluminium alloy under multiaxial bending-torsion loading. Based on the analysis of the initial equations of the plastic state,established the distribution of strains in the initial and final stages of axisymmetric drawing. The dependencies to assess the accuracy of linear and diametrical sizes taking into account volumetric of strain state. The article is dedicated to an approach optimizing a task of statistical modeling of the mechanical properties of products in real production metallurgy design. The approach is designed for the benefit of producers-metallurgists aimed at providing panels of Ti – alloys of a specific set of eventual industrial properties. This is accomplished by a procedure of composition optimizing based on existing certificates of brands Ti – alloys. The article presents an approach using mathematical models of optimization problem following the implementation of approach the classical methodology capable of decision-making in the production practice. The aim of this study is to investigate the design of continuous fiber reinforced composite pipes, produced by filament winding technique. For this purpose, the full factorial experimental design was implemented. When designing filament winding composites three major factors are the most important: fiber orientation, fiber tension and velocity of the filament winding. The ultimate target is to achieve the composite pipes with good characteristics as bearing material for construction with the lowest possible weight. Preparation of the composites was done by applying the 23 full factorial experimental design. For the purposes of these investigation, eight test specimen configurations are made and on the basis that, test results should provide material properties useful in the design stage. The velocity of the filament winding was taken to be the first factor, the second – fiber tension and the third – winding angle. The first factor low and high levels were chosen to be 525 m/min and 21 m/min, respectively, for the second factor – 64 N and 110 N, respectively and for the third factor – 100 and 900, respectively. In tensile machines to measure the change in length of the specimen during the stress, most time extensometer and various contact methods and tools, such as strain gauges are used, but these methods have limitations and low accuracy that cause unexpected and different results from the theoretical values for the strain. In this paper, to address this shortcoming and improve strain measurement, a non-contact method using image processing techniques in the MATLAB environment is introduced. for this purpose after capturing a move of tensile test and converting that in to some high quality pictures and using image processing we put some pattern in the first image and with using a special algorithm with name of Digital Image Correlation (DIC) detect that patterns until the last image then we can use of displacement algorithm and calculate change in the specimen’s length and after that we can also have “Strain” with using these values. AISI 316Ti stainless steel is prone to local corrosion in aggressive chloride environments. Its resistance to pitting in the absence and presence of molybdate inhibitor was tested by two independent tests with different mechanisms of corrosion process: by exposure (24 hours immersion test) and electrochemically (potentiodynamic polarisation test). Both tests were carried out in 1 M chloride acidic solution without inhibitor and with two different amounts of added inhibitor (concentration ratio inhibitive/aggressive anions was 1:10 and 1:20 respectively), at room temperature. Results of immersion tests were evaluated on the bases of corrosion rates calculated from corrosion losses during immersion and by morphology of pitting. Results of potentiodynamic polarisation tests were evaluated by pitting potentials. The structural, elastic, electronic and phonon properties of Cu2MnZ (Z=Al, Si, Ge, Ga, Sn, Sb, In) are investigated by first-principles calculations based on density functional theory. In this approach the local-density approximation (LDA) and generalized gradient approximation (GGA) are used for the exchange-correlation (XC) potential. The calculated lattice constant, bulk modulus, and elastic constants are in agreement with the previous ab-initio calculations and available experimental results. Electronic properties are discussed from the calculations of band structure and density of states. The direct method is used to derive the phonon frequencies and density of states. Due to technological particularities of low carbon low alloy API 5L X80 steels producing they have strong texture and its inhomogeneity on plate thickness. Charpy impact tests at ambient and negative temperatures and investigation of texture of samples of API 5L X80 steel were performed. By the method of X-ray structural analysis DPF, IPF and ODF were obtained. Texture components and their volume fraction were determined. It was shown that correlation between volume fractions of main texture components, misoriented grains fraction and DBTT exists. As a result analysis of texture parameters allowed characterization of effect of texture on cold resistance of low carbon low alloy API 5L X80 steel. The process of low-temperature tempering has been studied by eddy current testing and measuring the hardness HRC at a constant temperature as well as at increasing temperature and duration. Technological factors of tempering were considered in their interdependence, according to the Hollomon-Jaffe equation. It has been argued that the factor levels, temperature and duration, are determined by the carburization and quenching results. Eddy current testing has been introduced as an indicator of quality with high sensitivity to changing technological factors; it has integral importance in terms of structural changes and electromagnetic properties of the parts. Hardness and electromagnetic characteristics, as indicators of quality after low-temperature tempering, were presented as a function of the tempering parameter Pa. In frame of the project KEGA 027STU-4/2014 at our institute, we are building a virtual laboratory of robotics. The main objective is to build a laboratory together with a set of training modules in the field of automation and industrial robotics that will serve to teach the principles of automatic control of manipulation and programming of industrial robots, which are now increasingly implemented in production practice. Built laboratory will develop the knowledge and expertise of students in the field of automated and robotic systems, application of innovative educational program and methodology of using modern technologies, including CA and e-learning.